This jam is now over. It ran from 2017-01-21 05:00:00 to 2017-01-23 00:00:00. Welcome to the jam site for the inaugural Utah Kids Jam 2017! This is a jam for kids under 18 years old. 13-17 age may participate without a parent/guardian. Under 13 a parent needs to be around for the jam. The people in the kids jam can't join teams in the global game jam because of the new age policy. They have to form teams on their own in the age group in the Utah Kids Jam. This jam is for youth in Utah to participate in a game jam. They will form teams with other youth (and their guardians), get a theme, and over the course of 48 hours they will make a game prototype. This game jam is not a competition, but an opportunity to learn more about game development or just have fun trying something new, and meet new creative friends. None. This is a free event thanks to the volunteers and sponsors. Be sure to give them your thanks and support if you enjoyed the event! Sponsors and donations are happily accepted. If you like you may email the organizer at vazor222@gmail.com for their mobile phone number beforehand in case you get lost! You can park on the north, east, and south sides of the building (but avoid west and southwest). We will be restricted to specific rooms on the 4th floor. Listen for the available rooms during opening ceremonies. All other rooms are strictly off-limits. The doors will be locked during night hours. It is a good idea to get someone's number before you leave in case the doors are locked or you can't find your way back. Plan to bring or buy food from nearby stores. There is a fridge and microwave you can use. NOTE: Everyone is expected to clean up after themselves! If you fill up a trash can, and there are spare bags available, replace the bag and take the trash out to the dumpster outside. Computer or Laptop - For uploading your final game (either the digital game prototype you've made, or the print and play tabletop game you've made). IMPORTANT: The entire event will be WIRELESS ONLY. This of course also means latency will be higher and so it is even more important that we limit how much streaming and bandwidth usage we try to use. The SSID (wireless network name) is "Special Event". The password is "specialevent" - no quotes (WPA2 Secured). All nearby wall ports will be disabled, so users will need to use wireless, or ad hoc/LAN connect to someone that can share their wireless connection. They will not make any exceptions. "The network is limited to 150 clients for both wireless and physical connections. I wanted to give you a heads up on this, because it's getting more and more common for people to have cell phones, tablets, and a laptop. Please note each device connected is considered a client. This is important because it's pretty easy for one user to take up 3 IPs without realizing it (Connecting all their devices at the same time.)" So, be sure to bring wireless access for your computers! If you don't already have all the software you'll need installed, you'll also need Administrator rights to install software on your machine. Paper, Pen, Pencil, Coloring, Pieces, Tokens, Whiteboards, etc. - Useful materials for exploring game ideas in person with your group. For board game designers, if you have some prototyping materials you don't mind sharing, please bring those as well! Parent or Guardian - You and a parent or guardian need to come at the beginning to sign a release form. We are all just volunteers and we want you to understand the risks involved and avoid having someone sue us or our sponsors. Phone - It is a good idea to have a way to contact friends and family in case of emergency, and to call the organizer in case of locked doors, getting lost, etc. Food - You will need money if you plan to buy drinks/snacks on site or go out to eat. There will be a guide for nearby restaurants. You are also free to bring a cooler of food for yourself if you prefer. There will be a fridge and microwave on site as well that you can use if you want; just be sure to clean up after yourself. Overnight Bag - If you plan to stay all night, you will need the usual toiletries and personal hygiene products to keep yourself clean and presentable (even if you don't have access to showers, you can still bring deoderant and other similar tools to make it easier for people to be around you). You will probably also want a sleeping bag and pillow. Volunteers are generally available all night both nights to help and monitor participants. Camera - A camera can be useful for documenting ideas and just plain fun for remembering and sharing the event! During opening ceremonies, we will have some social exercises to get people relaxed and comfortable (especially in cultures where people are shy by nature)- no more than half an hour on this. After people are relaxed, we will start with the constraints/themes and idea pitches and group forming. The way pitches work is that people form two-person teams with whomever they are sitting next to. They get 10 minutes to come up with one or more ideas that fit the constraints. After 10 minutes, each team gets exactly 30 seconds to pitch each idea to the entire room (with an organizer being time keeper to keep this moving along). You may bring paper and tape if you like. After all ideas are pitched, the owners of each idea are trying to sell their ideas while other participants are shopping around for an idea they would like to attach themselves to. For idea owners who are unable to sell their ideas, they will have to give up on their idea and join someone else's group. If you had your idea on paper, you may take your idea, and attach it to yourself. Be sure you end up with a group that is willing to submit to Utah Kids Jam instead of another jam. Teams with youth participating should be planning on submitting to the Utah Kids Jam site only. This idea brainstorming continues until everyone has a tentative group - no one may leave until everyone is part of a group! Note that the initial idea of the group does not necessarily have to be the final game your team makes- it is more about finding people you will work well with. Everyone will use this time to get their team and their tasks organized. If your team decides to leave before 8pm for any reason, please note that we may be forced to have someone assigned to you without the chance for you to talk with them first. Remember that this is not a competition. If you are experienced, please be willing to help answer questions from other teams and help out. If you are learning and have a question or get stuck on something, please don't hesitate to ask for help from other teams, and solicit feedback and opinions on your work! Feel free to use the utahgamedev slack channel #globalgamejam to chat or post questions online as well. This is where schedule updates and announcements on-site will be posted. Each team must have one person with an account on itch.io to submit their game project. Come to this jam site during the submission period (before 4pm Sunday) and fill out the form and upload your game. After it is uploaded you can make changes, so feel free to upload early and often. After your upload starts at 4pm on Sunday, you should start practicing your presentation. Presentations are limited to about 5 minutes, so figure out how much gameplay you want to show, and please also include postmortem thoughts (what went well) and lessons learned. Once the event is over, jammers are free to do whatever they want with the work they've done, including build it into a commercial offering or publish it in their portfolios. Please consider highlighting the fact that it was created at this jam as you share it around. Every jammer should create an itch.io account and give feedback to all the other submissions over the following weeks. 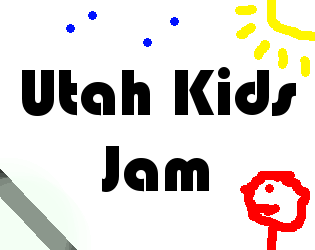 The Utah Kids Jam is a volunteer-run event and is supposed to be fun and collaborative, with a goal to keep things very simple. We provide structure and inspiration but the participants need to be responsible for themselves. We expect that no team/makers of a game will participate in illegal activities such as exploiting others' IP. The jam version of the game should be open source and becomes part of the public domain. All participants agree that their participation in the Utah Kids Jam will hold no one liable for any loss or damage. We want to encourage an atmosphere of friendly collaboration, mentoring, and learning. We have a code of conduct and no harassment policy we will enforce. We reserve the right to refuse to allow anyone to participate at any time for any reason or no reason at all. This includes after the game jam has already started. Can I finish early? Can I participate part of the time? Yes, but be sure to be up front and clear about your commitment with your team before you get started. Find a team that is willing to work with you to merge your work before you have to leave. Note: some teams opt to finish Saturday - these teams can stop by for presentations Sunday, send a representative to show their game, or send the organizer instructions on how to show their game for them along with notes and comments for their presentation. Is it allowed for participants to use an existing framework, code library, game engine, etc.? Yes, however the creators should have rights to everything they use (e.g. all content not created on site should be licensed or public domain), and anything distributed should be open source. The spirit of the game is learning and so one of the goals should be to be able to see and learn how the other teams made their games. Yes! We have had successful board game projects in the past and welcome participants who want to work on a tabletop or other physical game. The upload should consist of a print-and-play version of your game. Do participants have to sign up as part of a team ahead of time? No, and in fact we strongly encourage you to form teams made of total strangers. Game jams are a wonderful opportunity for participants to expand their horizons, challenge themselves, and meet new people. These benefits are greatly lessened if participants sign up in a group with their friends. Is there a required minimum or maximum team size? There are no official limits. In practice, you want each team to have all skill sets covered (especially programming, art, and game design) so it will usually not be practical to have a team of less than 3 people. Once team size starts to get over 5 or 6, communication and time spent merging/integrating work gets to be an issue. Yes, but they will be expected to be silent and non-disruptive during the work period. If there is a slight chance you would participate, don't be surprised if you are pulled in during the idea pitch phase. Be prepared to run home for your computer! Spectators will still at least be required to sign the release, but they will not be required to register on the website. Our site does allow complete remote participation; just email the organizer your intent so we know not to be worried when we see you signed up on the website but nowhere to be found at the venue. Can I participate for only part of the time? Absolutely; partial participation is just fine, but be prepared to face the possibility that you'll have to be on your own team because of your limited availability. However it is possible there would be a team that would be willing to work remotely. Like in real life, you would have to be extra communicative and extra strict on what assignments/tasks you take on for the group. Can I bring my infant with me? No, unless you can guarantee they will not be disruptive, and you are willing to take them out if there are complaints. Children interested in participating will be treated as regular game jammers if they are able to contribute and not be disruptive. What happens with my team/game after the event is over? Whatever you want! You still own the game and you can continue to polish it or work with your team on a longer project if you like. How can I help make this event better? If you or anyone you know would like to volunteer and/or sponsor, let the organizer know. What if I have other questions that aren't covered here? Email the local organizer with any questions or suggestions. How do I find the local organizer?